It’s the middle of the night on Cape Cod, Mass. 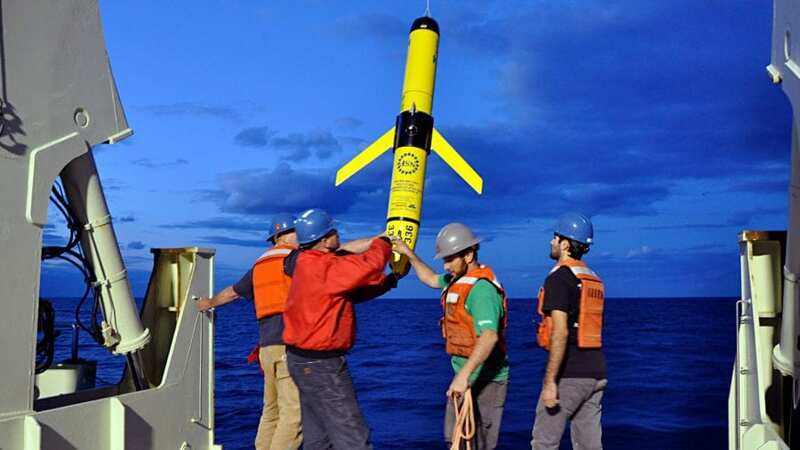 Thousands of miles away in the South Atlantic off the coast of Argentina, a bright yellow torpedo-shaped drone floats up from the deep ocean and emerges at the water’s surface. Pummeled by wind and waves, the driverless underwater vehicle—an ocean glider—tips forward to raise its tailfin farther out of the water. Inside, a satellite antenna gets a GPS fix on the vehicle’s position and sends out a call. Moments later back in Massachusetts, cell phones light up, blaring their alert tones: A glider needs help. For Woods Hole Oceanographic Institution glider pilots Peter Brickley, Diana Wickman, and Christina Haskins, it’s time to wake up and get to work. 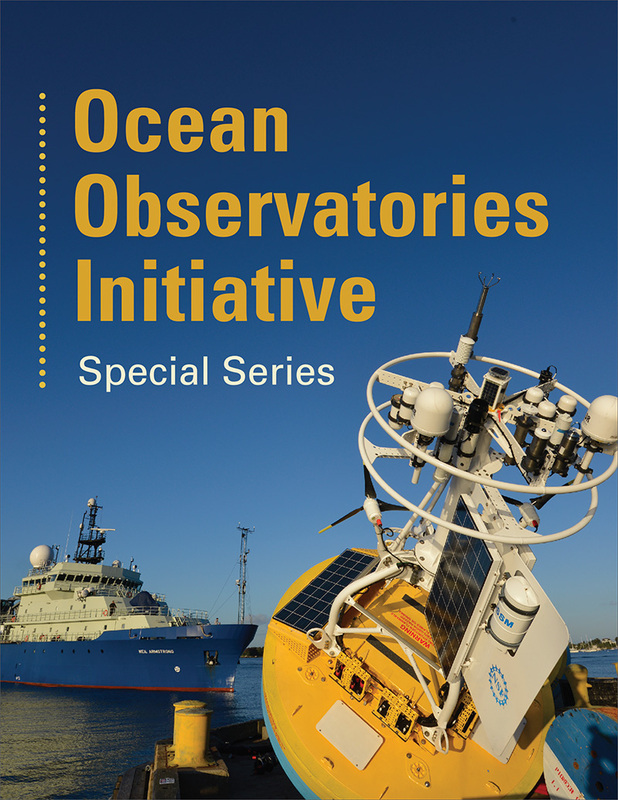 This “drone” doesn’t belong to the military—it’s in the service of oceanography: specifically, the Ocean Observatories Initiative (OOI), a large-scale, long-term data-collection project funded by the National Science Foundation. The OOI’s infrastructure consists of several mooring arrays, two propeller-driven autonomous underwater vehicles, and the United States’ second-largest fleet of ocean gliders after the Navy’s. Operating at distinct locations in the Atlantic and Pacific Oceans, the moorings and underwater vehicles are outfitted with instruments and sensors to collect unprecedented data on ocean currents and chemistry, marine life, and Earth’s changing climate. WHOI’s gliders patrol the OOI’s Pioneer Array about 90 miles off the New England coast. They also have been dispatched to remote, high-latitude Global Arrays near Alaska, Greenland, Argentina, and Chile. WHOI’s glider pilots oversee a total of 64 OOI gliders, with as many as 26 vehicles in the water at one time: five at each Global Array and six more at the Pioneer Array. 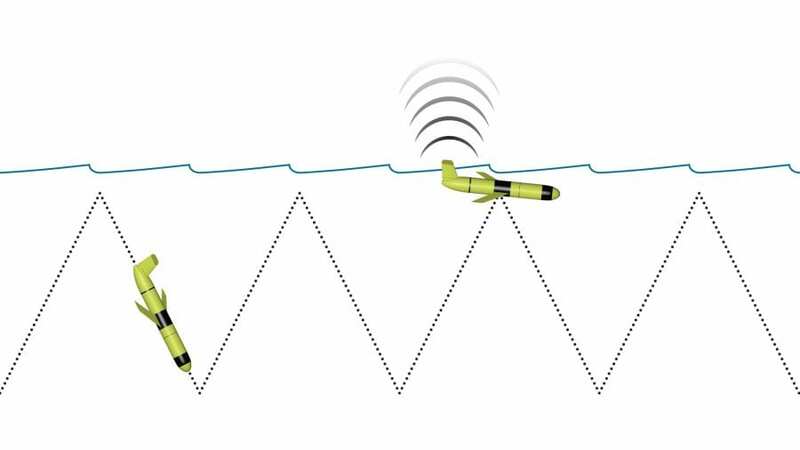 Before they hit the water, the gliders are programmed with their missions, including a series of waypoints laying out the path each one is to follow. Many traverse vast swaths of ocean and can dive to depths of nearly 3,300 feet. They carry a payload of scientific sensors to collect data on a variety of ocean properties for the scientific community. Brickley, a senior engineer who leads the operations team that oversees WHOI’s OOI gliders, says the vehicles’ endurance is one of their greatest strengths. 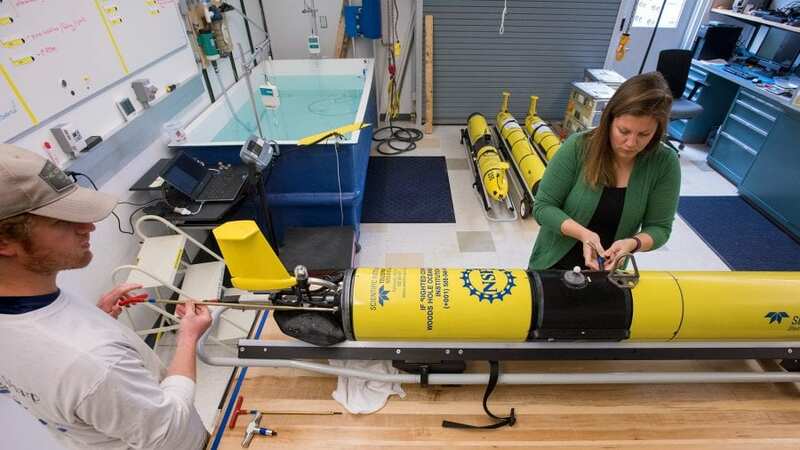 But even “autonomous” underwater vehicles need a lot of supervision, when you’re trying to keep them going for months at time in an often hostile ocean. Keeping tabs on a fleet of gliders at very different locations has its challenges. The pilots can’t see their vehicles or physically interact with them. And while a glider is submerged, there’s no way for pilots back at WHOI to find out exactly where it is or how it’s doing, because satellite communications don’t work under water. A glider has only a magnetic compass, an altimeter, and dead reckoning to guide it until it comes back to the surface to get a GPS fix. Then it literally “phones home”—calling over the Iridium satellite service, the same system that allows people to make calls from remote locations with no cell phone service. The glider’s call is relayed in near-real time to a computer in glider mission control: the Coleman and Susan Burke Operations Room at WHOI. A software program sounds a bell-like alert tone and announces the surfacing glider’s name: “cp387” for one of the gliders at the coastal Pioneer Array, for example. One of about a dozen computer screens lining the walls of the operations room springs to life, and line after line of codelike text scrolls by: the “conversation” between gliders and pilots. Another screen displays a map crisscrossed with yellow glider tracks; still another, the jagged red plot of one glider’s V-shaped dives. But the pilots don’t need to be in the operations room to monitor the gliders’ progress. Once a glider has surfaced, a pilot can use the two-way Iridium connection to send the vehicle instructions: a new sampling plan, new destination waypoints, or new “yo” files—the software scripts that tell a glider how deeply to dive. The glider, in turn, responds to the pilot, sending its position, its remaining battery life, and a small subset of its engineering and science data—only a small subset, because making an Iridium call takes a lot of battery power. To conserve the gliders’ energy, the pilots try to keep them on the surface for less than 15 minutes. As a result, most of the data a glider collects are stored in onboard memory to be downloaded after the vehicle is recovered and brought back to WHOI for maintenance. The OOI gliders are almost always launched from a research ship—often at night, to accommodate other ship operations that need to happen in the daytime. A glider is equipped with a strobe light, making it easier for the ship’s captain and crew to see the relatively small vehicle once it’s in the water. “You have to make sure the boat knows where the gliders are,” said Haskins, who has been piloting ocean gliders for eight years. “A lot of times, deployments might happen at midnight. 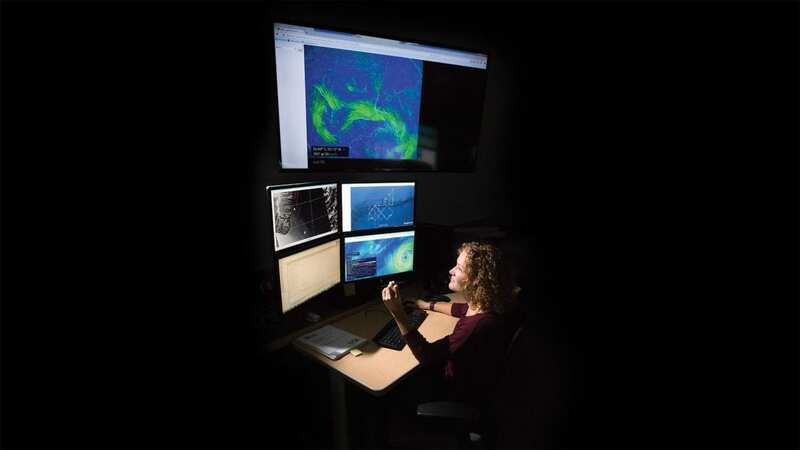 They might happen at 2 a.m.” For the glider pilots back at WHOI—or on their laptops at home—that can mean piloting throughout the night, sometimes for several days in a row, depending on how many gliders are being launched. “Deployments typically are all-nighters,” Brickley said.” We want to make sure that all the testing has been done on the vehicles, and that everybody’s happy”—before a glider gets too far from the ship. One pilot on the team acts as point person, staying in satellite communication with the bridge throughout an entire series of launches. Once a glider has been launched, its pilot has to test it remotely to make sure all its components are working properly. To make sure the gliders are ready for full-time life at sea, the pilots take them through a series of test dives. All the testing and flying doesn’t give pilots much time to relax—or sleep. Just trying to keep the slow-moving gliders on course in ever-changing ocean currents presents a huge challenge. The winged vehicles have no propeller; they glide through water using a bladder to increase or decrease their buoyancy. To initiate a descent or ascent, a heavy battery pack shifts forward or aft inside the glider’s hull, changing its angle in the water. In this way, gliding down and up doesn’t take much energy, which allows the vehicles to conserve battery power for their many months at sea. But without a propeller, gliders can’t go much more than half a knot—a little more than half a mile per hour—leaving them at the mercy of the currents. The pilots have to keep a watchful eye on environmental conditions such as sea surface temperatures and currents. “You’ve got to know when you’ve got storms that might be heading your way,” Haskins said. If a storm drives a glider off course at a place like the Pioneer Array, the vehicle can quickly find itself in trouble. “The Gulf Stream is knocking on our doorstep,” Haskins said. Not far beyond the Pioneer Array, the powerful Gulf Stream current travels upward of five miles per hour—ten times faster than a glider. The pilots can reprogram vehicles remotely to try to keep them on course. But even if the gliders avoid the currents, they still have to deal with marine life. “Anything that can latch onto a vehicle and is happy being there will live and grow and create problems for you,” Brickley said. That includes everything from mussels and gooseneck barnacles to small suckerfish known as remoras, which normally attach themselves to large marine animals such as sharks or whales. Biofouling, as it’s known, can weigh gliders down and keep them from getting to the surface. Larger life forms occasionally cause problems too. Sharks have been known to attack gliders, and people have accidentally run over them in boats or pulled them out of the water. If nothing else goes wrong, gliders can still run into mechanical problems or software glitches after months at sea. The stakes are especially high for gliders at the remote Global Arrays. Despite these challenges, WHOI’s pilots have completed more than 80 successful glider deployments at the Pioneer and Global Arrays over the past four years. The vehicles have flown a cumulative total of nearly 75,000 nautical miles—the equivalent of traveling more than three times around the Earth at the equator. Together, WHOI’s OOI gliders have gathered more than 9,000 days’ worth of data since 2013. For a glider pilot, there is no such thing as a typical work day. There’s always something needing attention. That’s on top of the many more routine hours the pilots spend checking on gliders that are already at sea, inspecting and analyzing plots of engineering and science data to make sure everything is working the way it should be. The gliders are programmed to surface at regular intervals and call in updates. If all is going well, an automated answering system sends back a response, and after some self-checks, the glider continues on its way—no pilot needed. But a glider will also surface when it has a problem and temporarily needs to abort its mission. Haskins says aborts invariably seem to come at the worst time. During even the most routine of missions, a glider can experience unexpected problems. Most are relatively easy to deal with: a typo in a command file, a waypoint correction, or a rudder knocked out of position by waves. But some problems start small and grow worse with time. “We have our phones on, and the abort messages turned on, 24 hours a day,” Wickman agreed. Both she and Haskins have the gliders’ text messages set to special alert tones on their cell phones: Haskins’ is a klaxon alarm, and Wickman’s, a clown horn. “When I hear that, I know: That’s a glider abort,” Wickman said. It’s not a particularly ominous sound, but it does get your attention—particularly if an abort call comes in the middle of the night. Wickman, Haskins, and Brickley will be right there, doing what it takes to help the gliders back on course.